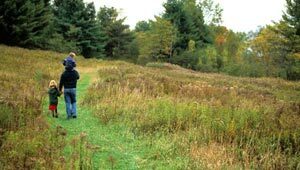 In 1995, TPL helped the city of Montpelier acquire 152 acres as an addition to the city's North Branch Recreation area, which includes a network of trails, parks, and open lands. This land provides important habitat for beaver, moose, and other wildlife as well as expanded opportunities for low-impact recreation. Critical support for this project was provided by the Montpelier Conservation Commission, Vermont Land Trust, and East Montpelier Trails Association.